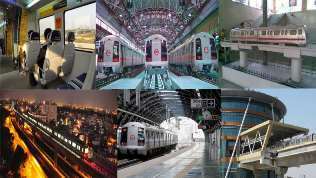 Chennai: With the opening of the near nine-kilometer metro lane in Chennai, around 324 kilometres of metro rail will be operational in the country in the cities of Delhi and NCR, Gurgaon, Kolkata, Chennai, Bengaluru, Jaipur and Mumbai, said Minister of Urban Development, Housing & Urban Poverty Alleviation, M Venkaiah Naidu. During the inauguration of the 8.61-kilometer metro line from Little Mount to Airport today, he said that Chennai has around 19 kilometres of metro operational out of the total 45 kilometres in Phase 1 of the Chennai Metro Rail Project. The Government of India has so far released about Rs 10,000 crore for the Chennai Metro Phase-1 project. With this, around 324 km of metro rail is operational in the country. Around 520 km is currently under construction in various cities including Delhi and NCR, Kolkata, Chennai, Jaipur, Mumbai, Kochi, Ahmedabad, Nagpur and Lucknow and another around 553 km is under consideration. One four-car metro rake per trip is expected to remove 16 buses/300 cars/600 two wheelers from road. This not only reduces traffic congestion but also reduces pollution. The ridership at the completion of the Phase I of the Chennai Metro Rail Project is expected to be 775,000 per day, he added. An elevated section of 10.15 kilometer from Koyambedu to Alandur of Phase-1 was inaugurated in June 2015. Speaking about the smart city projects, the minister said that Tamil Nadu has the highest number of smart cities approved, with 12 in the list. Chennai and Coimbatore, selected in the first round, would see a total investment of around Rs 1,366 crore and Rs 1,570 crore. In the second round of announcement, Madurai, Salem, Vellore and Thanjavur were selected. Total of 49 projects have been identified by Chennai, while Coimbatore has identified four projects and bidding is underway. Special Purpose Vehicles has been established in Coimbatore and Chennai and Rs 200 crore as central government grant out of Rs 500 crore sanctioned has been released to these cities, he added. So far, the centre has approved investments to Tamil Nadu, including Rs 2936 crore for Smart City Mission, Rs 7,082 crore for Atal Mission for Rejuvenation & Urban Transformation (Amrut) mission, Rs 45 crore for Hriday, the heritage city development and Rs 1,796 crore for housing mission, setting the urban renaissance in Tamil Nadu in motion, he added.